Urochloa decumbens (Stapf) R. D. Webster, Brachiaria bequaertii Robyns, Brachiaria brizantha sensu Senaratna, Brachiaria eminii (Mez) Robyns, Panicum eminii Mez, Urochloa eminii (Mez) Davidse. Many Brachiaria species, including Brachiaria decumbens, have been placed by some authors in the Urochloa genus, so the taxon Urochloa decumbens is often considered as the correct. However, these changes remain disputed and many recent papers still refer to Brachiaria decumbens (Torres González et al., 2005). Brachiaria decumbens cv. Basilisk is now considered in the taxon Brachiaria brizantha (FAO, 2016). 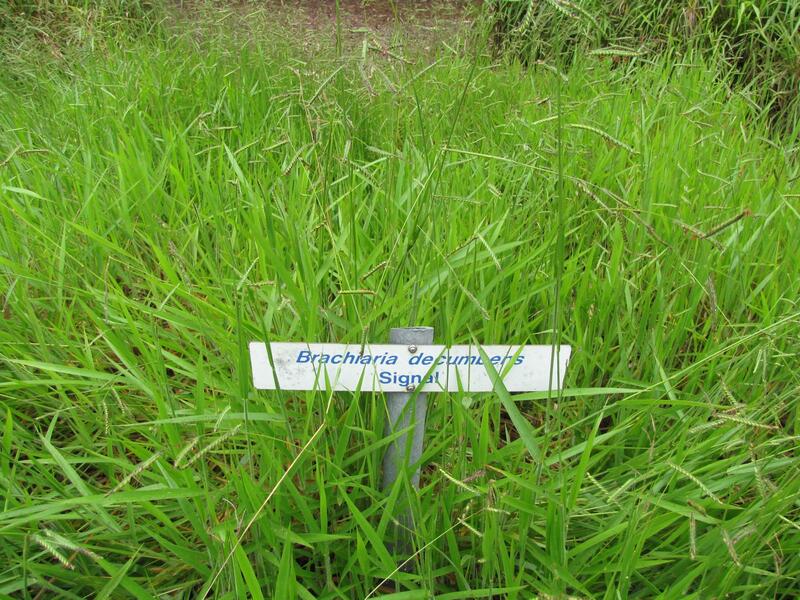 As this cultivar is particularly popular in South America (Cook et al., 2005), many of the feeding trials related to Brachiaria decumbens could be reinterpreted as actually concerning Brachiaria brizantha. Signal grass (Brachiaria decumbens Stapf or Urochloa decumbens (Stapf) R. D. Webster) is a tropical and subtropical grass widely cultivated for forage. Signal grass (Brachiaria decumbens) is a vigorous, rhizomatous and stoloniferous, medium-lived (5 years) perennial grass. It has a dense root-system with many bunched, quickly growing roots that go as deep as 2 m (Husson et al., 2008). Signal grass has a prostrate or decumbent habit and grows to a height of 60 cm. Its flowering stems can be up to 1 m tall, arising from the stolons (Cook et al., 2005; Loch, 1977). The leaves are short, hairy and bright green in colour (Cook et al., 2005; Bogdan, 1977). Leaf blades are lanceolate, 10-14 (-25) cm long x 8-10 (-12) mm wide (Husson et al., 2008; Cook et al., 2005; Bogdan, 1977). 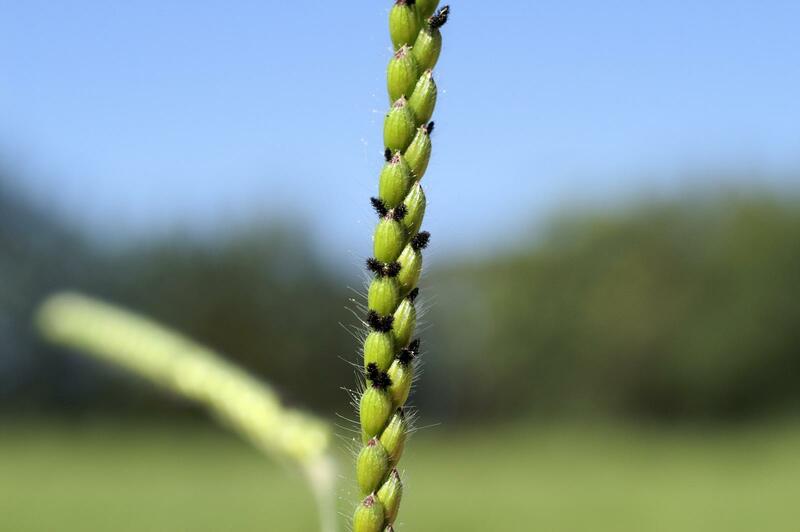 The inflorescence is a panicle with 2-7 slightly curved, 2-5 cm long racemes. The racemes are almost at right angles to the 10-20 cm long axis (Husson et al., 2008; Cook et al., 2005). 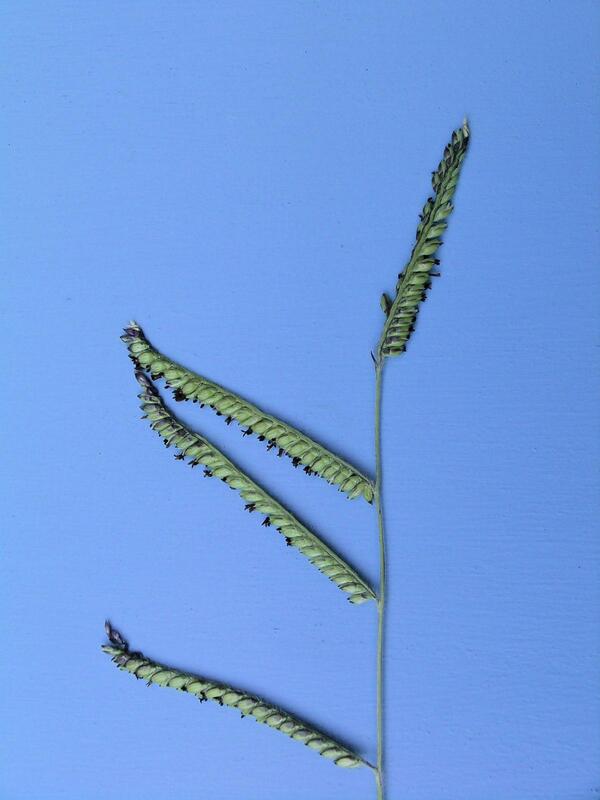 The spikelets are hairy, 4-5 mm long and borne in 2 rows along the rachis (Cook et al., 2005; Loch, 1977). A 1000 seeds weigh is 3.6 g (Husson et al., 2008). Brachiaria decumbens and Brachiaria brizantha are very similar morphologically, which has led to incorrect identifications (Miles et al., 1996). Signal grass mainly differs in its habit which is more decumbent, less tufted, and forms a looser cover (FAO, 2016; Cook et al., 2005; Schultze-Kraft et al., 1992). Brachiaria decumbens is one of the most cultivated species of the genus Brachiaria in South America, Asia and the South Pacific region (FAO, 2016). Unlike Congo grass (Brachiaria ruziziensis), it is relatively free of pest and disease problems although sporadic attacks by spittlebug (Cercopoidea) have been reported from South America (Loch, 1977). It is a valuable forage used in permanent pastures. It is high-yielding and forms low leafy stands that do well on infertile soils. It is palatable to all classes of livestock and withstands heavy grazing (Cook et al., 2005; Loch, 1977). Signal grass can be grazed, cut to be fed fresh or to be made into hay. Signal grass is used as a cover crop to prevent erosion and to control weeds and insects (Mollot et al., 2012; Cook et al., 2005). Signal grass originated from the highlands of Central and Eastern Africa (FAO, 2016; Cook et al., 2005). It is now widespread in the tropics and sub-tropics. It was introduced from Africa into sown pastures of humid lowlands of tropical America in the 1950-60's (Pizarro et al., 1996). Signal grass has been widely naturalized in South-East Asia and in the Pacific region (Schultze-Kraft et al., 1992). Signal grass is naturally found in open grasslands or in partially shaded areas, between 27°N and 27°S, from sea level up to an altitude of 1750 m. It grows in frost-free areas with temperatures over 19°C. Optimal growth occurs between 30-35°C (FAO, 2016), and where average rainfall is over 1500 mm. Signal grass has a deep root system that effectively extracts P and N from the soil. It can grow on a wide range of soils, including low fertile soils with a low pH (down to 3.5) and high Al concentration (it does better than B. brizantha in such conditions). Signal grass is also moderately tolerant of Mn. Unlike Rhodes grass (Chloris gayana) and many other perennial grasses, signal grass is sensitive to salinity (Deifel et al., 2006). It does not grow well on heavy clays subject to waterlogging but it is tolerant of a dry season of 4 to 5 months (FAO, 2016). 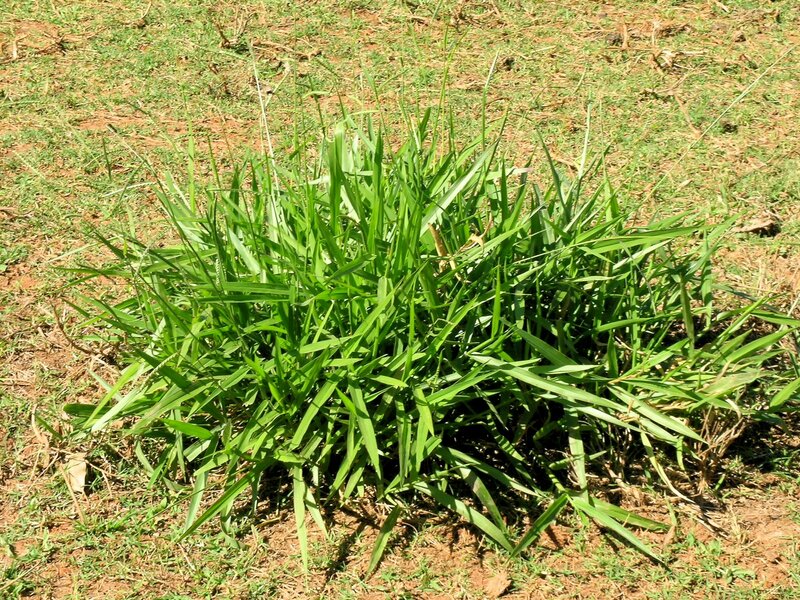 Signal grass remains productive late in the dry season and for this reason compares favourably to Pangola grass (Digitaria decumbens), Guinea grass (Megathyrsus maximus) and Para grass (Brachiaria mutica) (FAO, 2016). Signal grass is tolerant of shade and can be intercropped with tall species and in tree plantations (rubber, banana, coconut). It is less tolerant of heavy grazing under reduced light (Cook et al., 2005). Though not really subject to fire, signal grass can be burned and resume its growth from stolons and seeds with the onset of the rains (Cook et al., 2005). Signal grass can be propagated by seeds or by vegetative cuttings (leaves and rhizomes). Scarified seeds can be broadcast in a well prepared seedbed with companion legumes such as stylo (Stylosanthes guianensis), centro (Centrosema pubescens) or puero (Pueraria phaseoloides), which will be covered after a few months because of the pioneering habit of the signal grass (FAO, 2016). Hetero (Desmodium heterophyllum) appeared to do better as a companion legume (Cook et al., 2005). In N deficient pastures, signal grass and Brachiaria humidicola can be companion grasses to adapted legumes (Pizarro, 2001). In Fiji, pinto peanut (Arachis pintoi) formed stable mixtures with signal grass. In Indonesia, signal grass combined successfully with Arachis glabrata (Stür et al., 1996). Signal grass requires no more than 3 months to form a dense cover. It should then be heavily and frequently grazed to maintain leaf growth. Signal grass withstands trampling. Rotational grazing was recommended and stocking rates up to 10 head/ha could be withstood before the stand collapsed (Fisher et al., 1996). In Guyana, as its nutritive value declines slowly and its response to fertilizer is good, Brachiaria decumbens is considered suitable for intensive exploitation with cuttings every 6 weeks (Xandé et al., 1977). Signal grass is a high yielding species, particularly if N fertilizer is provided. Up to 30 t DM/ha can be obtained on fertile soils in Vanuatu, and the same biomass production is possible under coconut plantations in the Solomon Islands (Cook et al., 2005). The average yield is, however, generally lower at about 10 t DM/ha. Signal grass yielded 4 t DM/ha without fertilizer in Colombia (FAO, 2016). In subtropical environments production occurs between spring and autumn, decreases during dry seasons and ceases during winter (Cook et al., 2005). In Sao Paulo, in Western Brazil, the average availability of forage was 2.6 t DM/ha, of which about 50% was leaves (Garcia et al., 2004). Signal grass provides a good ground cover and improves fertility as well as soil structure in banana plantations and in other environments (Vézina, 2015; Boddey et al., 1996). Its deep and dense root system prevents soil erosion, facilitates water infiltration, decreases leaching of soluble nutrients and sequesters high amounts of C in the soil (358 t/ha) (Saraiva et al., 2014; Boddey et al., 1996). It was reported to be a valuable cover crop in upland rice systems. Growing signal grass before a rice crop resulted in higher rice grain yields when ammonium sulphate and a nitrification inhibitor were applied to the crop (Rosolem et al., 2005). It was successfully used in no-tillage tomato systems to reduce weeds and improve soil structure (Silva Hirata et al., 2009). Signal grass can be used for reclamation of lead-contaminated sites, road sides and urban areas where lead contamination is likely to have occurred. Signal grass has been found considerably more tolerant to lead than Rhodes grass (Chloris gayana), resulting in a 50% reduction of the lead (Kopittke et al., 2007). Germinating seeds and leachates of green parts of signal grass had allelopathic effects on Phalaris canariensis, Lactuca sativa (standard species) and Melinis minutiflora. This may have increased its invasive potential in the Cerrados of Brazil (Barbosa et al., 2008). In China, signal grass is used for dense pasture cover to control the invasive and poisonous Chromolaena odorata (Wu et al., 1991 cited by Cook et al., 2005). Among treatments, digging out of Chromolaena followed by burning and planting with signal grass was the most effective (Rusdy et al., 2013). In banana agroecosystems of the French West Indies, signal grass as a cover crop is increasingly used to control weeds and to improve physical properties of the soil (Mollot et al., 2014). In banana plantations of the French West Indies, signal grass increased the number of Solenopsis geminata, a predator of the banana weevil (Cosmopolitus sordidus), thus contributing to controlling this pest (Mollot et al., 2012). Like many other tropical grasses, the chemical composition of Brachiaria decumbens is highly variable and depends on the stage of maturity, which is at its highest during the period of slowest growth (Loch, 1977). Protein values ranging from 4 to 15% of DM have been recorded. In Trinidad, crude protein decreased from 13.1 to 9.1% of DM between the vegetative stage (3 weeks regrowth) and flowering (5 weeks) (Grieve et al., 1965). In Brazil, crude protein increased from 3.8 to 5.3% of DM between the dry season (July) and the start of the rainy season (November) (Garcia et al., 2004). In Cuba, crude protein decreased from 7.9 to 5.4% of DM between day 30 and 75 during a period of low rainfall, and from 8.4 to 6.3% of DM during a period of high rainfall (Vega Espinosa et al., 2006). The DM of signal grass has a high fibre content (21-41% crude fibre, 56-85% NDF, 30-47% ADF, 3-8% lignin) that increases with maturity. Hepatogenous photosensitization syndrome has been reported in cattle, sheep, goats and buffalo grazing Brachiaria decumbens in Africa, South-East Asia and South America (FAO, 2010; Lascano et al., 1996). This toxicity is caused by the presence, in the bile ducts and liver, of crystals of insoluble salts of sapogenin glucuronides originating from steroidal saponins present in signal grass. The sapogenin content varies in the same Brachiaria species, due to environmental stress, plant age and the stage of growth. Animals develop skin lesions, facial oedema, liver damage and rumen stasis that result in severe drops in weight gain (down to 40%) and in some cases death (17% of cases) if the animals are not removed from the pasture (Fagliari et al., 2003). The disease occurs within the first 30 days after grazing signal grass or until 60 to 90 days after (Riet-Correa et al., 2011). Outbreaks of Brachiaria spp. poisoning in central Western Brazil are frequently observed in pastures left ungrazed for more than 30 days. They also occur during the growing stage of the pasture at the onset of the rainy season (Brum et al., 2009). Sheep are more susceptible than other species, and lambs are more susceptible than adults. Differences of susceptibility existing among animals might be genetically inherited (Riet-Correa et al., 2011). Some buffalo and sheep might be resilient to hepatogenous photosensitization: poisoned animals showed histological lesions and high GGT serum concentrations but no clinical signs of disease. Selection of resistant or resilient animals as well as breeding signal grass varieties with low saponin content could prevent poisoning (Riet-Correa et al., 2011). Signal grass (Brachiara decumbens) is widely used as a forage in tropical regions. Signal grass is palatable during the vegetative growth stage, but coarse and stemmy growth is not well accepted by livestock (Loch, 1977). Reported values for in vivo and in vitro DM and OM digestibility show large variations. For instance in vivo DM digestibility ranges from 54 to 82% of DM (the latter for a 14-day old forage) depending on the stage of maturity and other factors (Loch, 1977). Used in pasture in Guyana in a 3 year trial, DM yield, DM digestibility, OM digestibility and N content of Brachiaria decumbens were higher than those of Digitaria swazilandensis (Xandé et al., 1977). In India, Murah buffalo heifers, fed ad libitum with chopped Brachiaria decumbens, had a higher digestibility of nutrients for Brachiaria decumbens (pre-flowering) compared to Megathyrsus maximus (Sanjiv et al., 1998). In Brazil, increasing the daily pasture allowance for dairy cows grazing signal grass from 4 or 8% DM of their live weight did not affect milk production and forage intake (Gomide et al., 2001). In Colombia, Holstein and crossbred dairy cows grazing a Brachiaria decumbens pasture, with controlled access for 1 or 2 hours after each milking to 2 forage legumes (Centrosema macrocarpum or Centrosema acutifolium), had similar milk yields, milk fat, solids-non-fats and protein levels. However, there was a tendency to higher milk production for the crossbred cows in the first month of lactation, which did not persist (Mosquera et al., 1992). Most studies on signal grass have been conducted with grazing beef cattle in South America, particularly in Brazil and Colombia. In grazing conditions, Brachiaria species are an important grass for cattle production in Brazil. Although satisfying performance has been reported for Brachiaria decumbens, different strategies have been studied to improve output by increased availability of forage and supplementation, including the use of legumes. Supplementation of signal grass pasture is usually favourable. However, in Holstein-Friesian/zebu heifers grazing signal grass pastures, preliminary supplementation with cottonseed meal had no effect on initial live weight, final live weight, average daily gain and pregnancy rate. DM intake was influenced by previous supplementation, but the effect decreased during the grazing period (Cavalcanti Filho et al., 2004). In finishing Nellore steers grazing signal grass pastures, supplementation with cottonseed meal mixed with soybean hulls gave better performance (carcass weight and yield) than cottonseed meal mixed with maize grain or citrus pulp (Andrade et al., 2015). In growing steers, supplementation at 0.8% of LW with a mixture of maize grain, whole soybeans, soybean hulls and cottonseed meal reduced forage intake and grazing time while increasing daily weight gain (Garcia et al., 2014). In crossbred steers grazing pastures of Brachiaria decumbens in the wet season, supplements such as ground maize grains, maize ears and cobs or ground sorghum, all increased performance, though maize ears and cobs were the most effective (Paulino et al., 2005). In young Limousin-Nelore bulls, supplementation with a mineral mix, urea and combinations of cracked maize, soybean meal and wheat bran increased DM intake, DM digestibility and average daily gains compared to animals supplemented with the sole mineral mix (Santos et al., 2004a). Growing steers supplemented with a mixture of cottonseed meal with either maize and cob with husks, cassava meal or soybean hulls did not show differences in performance, but cassava meal resulted in the best economic efficiency (Garcia et al., 2004). Some studies of supplementation have been less positive. Santa Gertrudis calves grazing on Brachiaria decumbens supplemented with a mixture based on soybean meal showed a significantly higher average daily gain in the dry season, but not during the wet season (Coutinho Filho et al., 2005). Supplements may help to compensate specific deficiencies that occur when grazing Brachiaria decumbens. When crossbred dairy calves reared on a sulphur-deficient pasture of Brachiaria decumbens were fed a basal-supplement containing minerals, urea and maize, with or without added sulphur, the sulphur-supplemented calves had a higher weight gain and a better body condition score than unsupplemented calves, who exhibited a loss of weight and body condition, retarded growth, and slight apathy (Ortolani, 2001). Holstein-Zebu dairy heifers grazing on deferred pastures of signal grass gained weight when the deferral period lasted 95 days and lost weight when the deferral lasted 140 days (Teixeira et al., 2014). In growing Zebu and Zebu x San Martinero bulls, supplementation with sugarcane and the forage legume Cratylia argentea gave better weight gains where animals were grazing fertilized signal grass than when they were supplemented in a corral. Grazing animals also gave better results with supplementation than without (Rincon, 2005). In Romo and Zebu x Romo steers, pastures of mulato grass (Brachiaria ruziziensis x Brachiaria brizantha) gave higher DM yields and supported higher meat yield and weight gains than pastures of Brachiaria decumbens (Cuadrado et al., 2005). In steers, a diet of signal grass hay mixed with soybean meal was compared with signal grass hay treated with either NH3 or urea. It was concluded that NH3 and urea treatments of the hay were not economically viable (Fernandes et al., 2002). In Brazil, Nelore cows grazing Brachiaria decumbens pastures, on a soil improved with limestone and fertilizer, and with free access to a mineral mixture, maintained good reproductive indices (pregnancy, calving and weaning rates) and productivity (weight of calves per ha) over four years (Vieira et al., 2005). In Brazil, giving whole cottonseeds (up to 49% of the diet) to sheep fed a basic diet of Brachiaria decumbens hay did not affect NDF digestibility (Teixeira et al., 2005). Green Brachiaria decumbens forage is moderately palatable for rabbits. When mixed at 50:50 with a legume forage (such as Lablab purpureus or Centrosema pascuorum), the total daily DM intake depends on the legume (Iyeghe-Erakpotobor et al., 2008). Signal grass has been used as green forage in small scale rabbit systems in Uganda (Lukefahr, 1998), and in Indonesia (Sudaryanto et al., 1984; Maskana et al., 1990). It is mainly a source of fibre due to its low protein content and very high NDF content. Its low calcium content (less than 4 g/kg for a requirement of 11-12 g/kg) and low phosphorus content make its use for lactating rabbit does questionable unless the diet contains an additional calcium source (Lebas, 2004). In Nigeria, Brachiaria decumbens hay is a standard forage distributed ad libitum or in limited quantities together with various concentrate supplements, both for growing rabbits and breeding does (Iyeghe-Erakpotobor et al., 2005; Iyeghe-Erakpotobor et al., 2006). When fed as a component of the diet, it usually represents about one third of the total daily DM intake of growing rabbits when offered ad libitum (Iyeghe-Erakpotobor et al., 2006). If ground Brachiaria decumbens hay is included in a complete balanced diet, the inclusion level may be up to 15-20% of the total DM. At such inclusion levels, and in the absence of any in vivo determination, digestible energy can be assumed to be about 8.5 MJ/kg DM with a protein digestibility of 54-55% (Lebas, 2013). Pizarro, E. A, 2001. Novel grasses and legumes germplasm: Advances and perspectives for tropical zones. In: XIX International Grassland Congress, São Pedro, São Paulo, Brazil. pp. 93-100.